Carl Eugen was only fourteen when his father died. 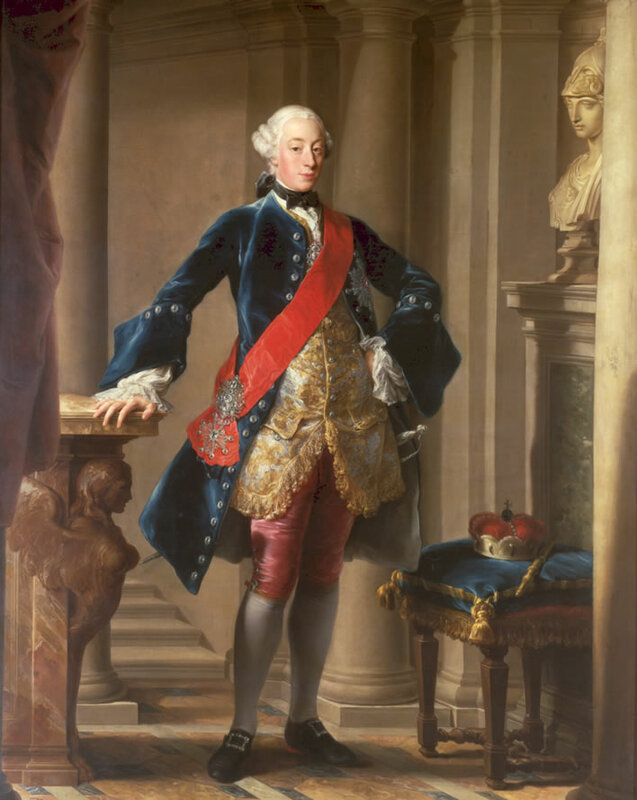 Frederick the Great of Prussia took the youngster under his wing, presumably to stop him falling under the influence of the old enemy, the Austrian Habsburgs. He spent two years at Frederick's court, exposed to the pomp and circumstance of the court of a great absolutist ruler. His Serene Radiance Carl Eugen, Duke of Württemberg (1728-1793), painted in Rome in 1753 by Pompeo Batoni. We discussed a pair of Batoni's famous sitters here. For the symbolism of the painting the 25 year-old Carl Eugen contented himself with himself, plus a bust of Minerva/Athena, the goddess of wisdom, the ducal crown and sceptre of Württemberg and very fetching pink silk knee-breeches. The absolutist monarchs and princelings of Europe looked to the French court for their example. Throughout the eighteenth century until the French revolution the radiance of the Sun King and his successors beamed across Europe. France became the arbiter of taste and behaviour in courtly life. This was a time in which many French words and expressions entered the vocabulary of the cultivated German. Germany had been just a patchwork quilt of tiny states since the Treaty of Westphalia had ended the bloody and enervating religious and territorial struggles of the Thirty Years War. The mini-despots of this patchwork quilt competed to achieve a taste of the lifestyle of the French court, usually ruinously. Schubart, at heart a German patriot, mocked the French affectations of the time but, characteristically able to hold two opposites in his mind almost simultaneously, was fully capable of playing the courtier with the required moral laxity when it was to his advantage. Carl Eugen came of age by special dispensation when he was 16 years old. It took about seven years from the moment he returned to Württemberg as ruler in 1744 for Carl Eugen's autocratic ways to blossom fully. By the end of this period his grasp of financial reality seemed to have withered and then disappeared completely. 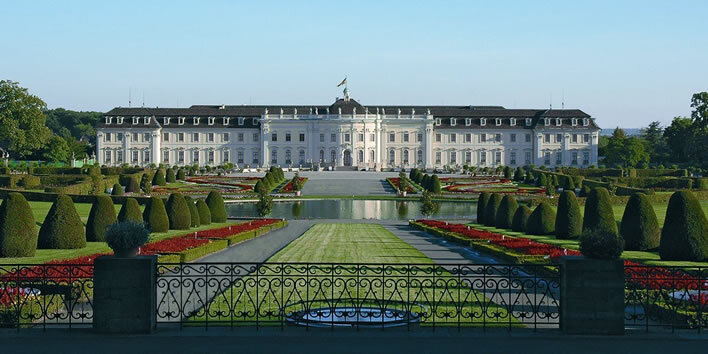 The Residenzschloss in Ludwigsburg, one of the largest Baroque palaces in Europe. 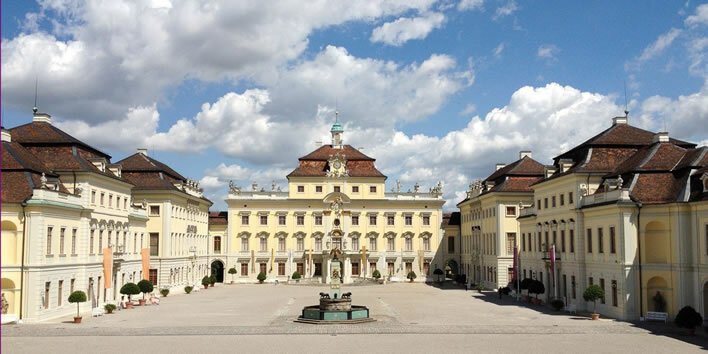 Carl Eugen moved his capital from Stuttgart to Ludwigsburg, a town that had been built to service the palace, and extended the palace considerably. ©Staatliche Schlösser und Gärten. At that time the Court of the Duke of Wurtemburg was the most brilliant in Europe. The heavy fees paid by France for supplying a troop of ten thousand men gave him the means for indulging in luxury and debauchery. It was a fine looking army, but during the war it was distinguished only by its mistakes. The Duke was sumptuous in his tastes, which were for superb buildings, grand hunting lodges, magnificent stables – every whim imaginable; but what cost him enormous sums was the large amount he paid in salaries, above all for his theatre and his mistresses. He had a Comédie Française, an Italian opera, grand and comic, and twenty Italian dancers, all of whom had been principal dancers in Italian theatres. Novers was his choreographer and his Director of Ballet, sometimes using up to a hundred performers at a time. A clever machinist and the best scene painters worked at great expense to make the audience believe in magic. The word extravagance does not do justice to Carl Eugen's insane expenditures; Without help, our own ordinary imaginations can barely grasp their extent. To our aid in this respect comes Josef Uriot, a noted French actor, who was appointed in 1760 as a librarian and actor at Carl Eugen's court. The Frenchman left us lovingly detailed accounts of the celebration of two of his Duke's birthdays. [On Thursday 16, the seventh day of the celebrations,] at six o'clock in the evening the entire court was taken in more than sixty coaches [from Stuttgart] to Ludwigsburg, the summer residence of the Duke. The coaches stopped in front of the middle gateway of the Orangery and the Duke welcomed in person the noble and foreign visitors to his birthday. 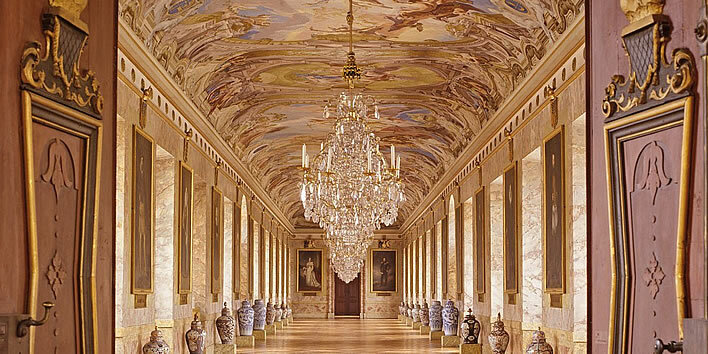 He escorted them and the entire nobility of the court through the avenues of the Orangery. The Orangery had been built in front of the south wing of the palace of Ludwigsburg. It was almost 832 feet long and 110 feet wide. For the birthday celebrations had been hung with blue cloth imitating the sky. It was well heated (we are still in deep winter) and dotted with pools and fountains. A great aviary had been built and stocked with birds of all kinds. The whole building was illuminated with nearly a million lamps. The orange and lemon trees formed high vaulted arches under which His Serene Excellence and his court promenaded. As the Duke was leading his guests towards the palace he was suddenly surrounded by clouds, representing the chaos before the creation. With a wave of his hand the clouds parted to reveal the summit of Olympus complete with its gods. Apollo asked Jupiter to suspend the battle of the rulers and the elements. He agreed. Thunder could be heard, Jupiter launched his lightning and the clouds disappeared and Apollo's rays lit up a gigantic construction, the 'Palace of Splendour', that roofed over the central courtyard of the palace. In the middle, framed by four gilded columns, was Olympus, surrounded by the four elements and the four seasons. A total of 200,000 candles and lamps illuminated the glittering room. The Duke and a chosen 32 of his guests took their places at a table in the middle of the room. A tableau representing Venus and sixteen gods of love arose from the middle of the table, raised by a machine. Each of the sixteen gods of love presented each of the sixteen ladies seated at the Duke's table with a porcelain bouquet of flowers, specially created by Carl Eugen's porcelain factory in Ludwigsburg. At the command of Venus, the wall of the 'Palace of Splendour' parted to reveal a stage on which a ballet and then a play were performed. As the guests took their places yet more presents were handed out. After the play the guests were escorted to a balcony to watch a firework display organized by the major general in charge of the artillery battalion. Thirty cannon and thirty mortars with flares fired continuously during the firework display. There were nine rows of fireworks, the first row containing the latest inventions of the firework maker to the French king. The firework figures included crowns, peacock tails, windmills, suns, arcades, pyramids, swarms of bees; in all 14,000 rockets were fired, the finale consisting of a salvo of 6,000 rockets. At nearly three o'clock in the morning the entire party was taken by coach back to Stuttgart. Everyone was in agreement that none of the legendary fêtes of Louis XIV had been better than this one. The comparison with the extravagant fêtes of Louis XIV is telling. Although the Sun King had died nearly fifty years before this moment and his celebrations had passed largely out of direct human memory he was still the measure by which the excesses of the absolutist monarch were judged. It is estimated that this one day out of the fourteen days of Carl Eugen's 35th birthday celebrations cost 400,000 gulden, of which the firework display alone cost 50,000 gulden. The following year there were also fourteen days of balls, ballets, concerts and plays. Uriot's meticulous account of that – in French, of course – was also published in 1765 as a book by the renowned publishing house of Cotta in Stuttgart. If you've got it, flaunt it. Ludwigsburg. Top: The courtyard behind the main building. Bottom: The Ahnengalerie, the 'ancestors gallery'. ©Staatliche Schlösser und Gärten. Unfortunately for Carl Eugen, he flaunted it but he didn't have it. The constant need for money to finance his ever greater extravagances drove him to despotic extremes: it was at this time that he started selling armies to the French and requiring the heavy hand of Rieger to see these measures through. 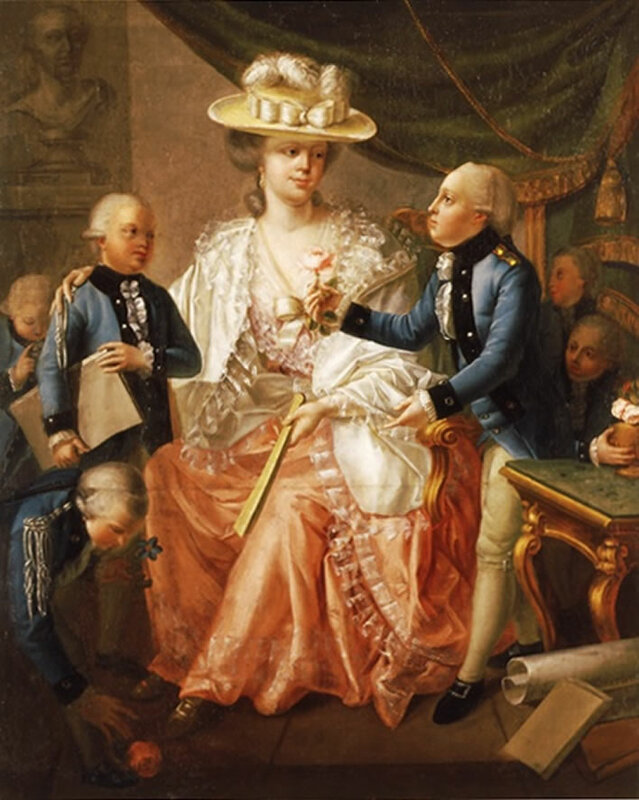 Under the influence of Franziska von Hohenheim the wild excesses of his first period, which had brought Württemberg repeatedly to financial ruin, gradually gave way to more enlightened pursuits, albeit still autocratically followed and still extravagantly beyond his means. So changed was he that on his fiftieth birthday in 1778, Carl Eugen even had an 'acknowledgement of his sins' read from the pulpit of every church in Württemberg. 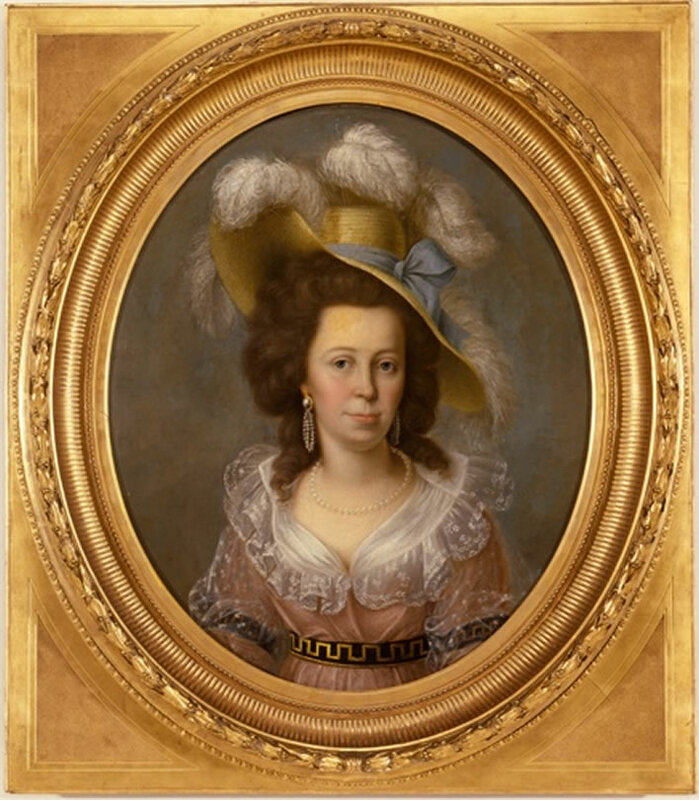 Jakob Friedrich Weckherlin (1761-1814), Franziska von Hohenheim, 1790. Franziska was 20 years younger than Carl Eugen and had started life as a commoner. Image: ©Landesmuseum Württemberg, Stuttgart. The new Carl Eugen could no longer be seen to imprison an artist and well-known journalist such as Schubart, however troublesome, without good reason. Nevertheless, the importance of Schubart's imprisonment for the Duke is underlined by the fact that both Carl Eugen and his wife Franziska were present for Schubart's arrival in Hohenasperg and watched him being taken to his cell. We have already speculated about the causes of this personal hatred of the Duke and Duchess for Schubart. No documents have ever been found that explain it. Schubart himself hinted at some dark secret that would become known in time, but never told us, even when he was a free man again. 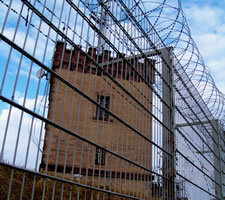 [Leben 2:131] Why Franziska would leave the warm palace to be at her husband's side in some freezing fortress whilst some annoying scribbler was banged up will therefore remain a mystery. No doubt in order further to underline the enlightened humanity of his treatment of Schubart, Carl Eugen granted Schubart's wife, Helene, a yearly pension of 200 florins – an amount barely above a starvation wage – and sent his son to be educated at the Carl's School in Stuttgart and his daughter to a ladies' academy to be trained as theatre singer and dancer. Jakob Friedrich Weckherlin (1761-1814), Franziska von Hohenheim zu Besuch in der Hohen Carlsschule, 'Franziska von Hohenheim visiting the Carlsschule', 1780. She is being given roses by the grateful pupils. Schubart's son Ludwig was attending the school at this time, paid for by Carl Eugen. Image: ©Landesmuseum Württemberg, Stuttgart.